HacDC Lightning Talks sessions feature 12 speakers, each talking for 5 minutes. Topics can be anything of interest to the speaker. Speakers submit their ideas for approval, and 12 topics are chosen for a given session. Rejected topics may be resubmitted for any future session. To submit a talk topic proposal, please e-mail Katie a title and brief description (if not self explanatory). Look for a red door facing the parking lot. Take the green line metro to Columbia Heights. The next round of HacDC Lightning Talks took place at 3:30 p.m. on Saturday, November 9, 2013, in the auditorium at Saint Stephen and the Incarnation Episcopal Church. The last round of HacDC Lightning Talks took place at 3:30 p.m. on Saturday, November 3, 2012, in the auditorium at Saint Stephen and the Incarnation Episcopal Church. Video footage of these talks has been uploaded to YouTube. See below for links to individual talks within the video footage. 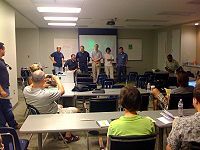 The most recent HacDC Lightning Talks took place at 3:00 p.m. on Saturday, June 9, 2012, in the dining room at Saint Stephen and the Incarnation Episcopal Church. We invited folks from other DC/MD/VA-area hackerspaces—specifically, Baltimore Node, Harford Hackerspace, Unallocated Space, Southern Maryland Hackerspace, Nova Labs, 757 Labs, Apple Space, FredHack, hack.rva, North Street Labs, Roastella Labs, and Reverse Space—to come check out our space that afternoon and join our lightning talks. Video footage of these talks has been uploaded to Youtube. Cycling the C&O Canal, by Nick B. 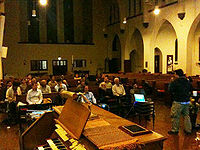 These talks were presented as part of Digital Capital Week's Digital Garage mini-conference at the Mount Vernon Place United Methodist Church. What an amazing Lightning Talks. The talks were well attended and the setup was better than ever with a great sound system setup and an actual camera crew. We had fantastic presentations spanning tech, science, art, music and even comedy. Top notch talks made this a night to remember and we managed to improve upon the first talks in several ways including more comfortable seating arrangements, video recording (will be posted here eventually), and smoother transitions between speakers with mini Q&A sessions. The cookies were tasty (if I must say so myself), and about a dozen attendees enjoyed drinks and mingling after the talks at a nearby pub. 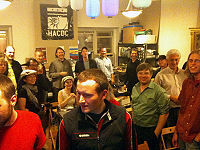 We packed the house with smiling hackers at the first monthly HacDC Lightning Talks! The talks were awesome and so were the cookies! Thanks to everyone who participated and made this a success. Next month will be even better organized with more space, better arrangement, more advance scheduling, and video recording. This page was last modified on 20 November 2013, at 08:34.